Qualcomm Snapdragon is a suit of System on a chip (SOC) semiconductor products for mobile devices organised by Qualcomm Technologie.inc. The Snapdragon CPU uses the ARM RISC instruction set. A single SoC may include multiple CPU cores, a graphics processing unit (GPU), a wireless modem, and other software and hardware to support a smart phone’s global positioning system (GPS), camera, gesture recognition and video. Snapdragon semiconductors are embedded in devices of various systems, including Android and Windows Phone devices. They are also used for notebooks, in cars, wearable devices and other devices. In addition to the processors, the Snapdragon line includes modems, wi-fi chips and mobile charging products. Qulacom has been launched various version of Snapdragon chipset where Snapdragon 712 is the latest version of Snapdragon 675. 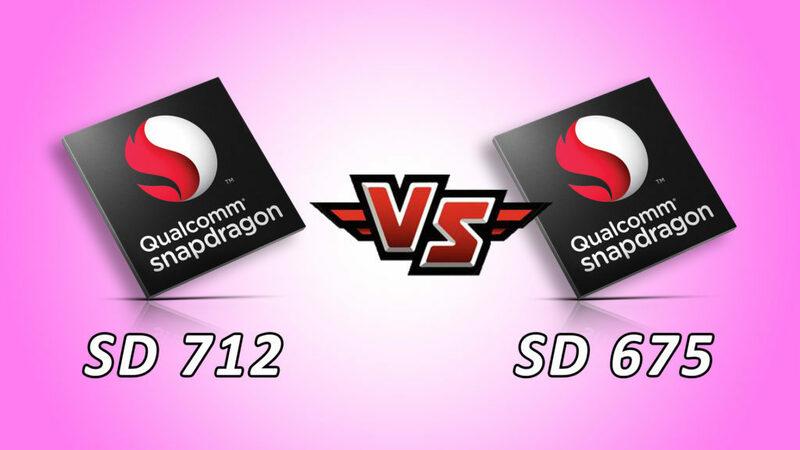 Lets comparison between Snapdragon 712 vs Snapdragon 675 which is better for you. The Snapdragon 712 is based on 10 NM FinFet It is a 64 Bit Octa-Core processor. It has 8 kryo 360 core. Qualcomm has increased the clock speed in snapdragon 712 to 2.3 GHz. The Snapdragon 675 is based on 11 NM fabricating process with Octa-Core processor. It has 8 cores based qualcomm’s kryo 460 technology. Qualcomm has increased the clock speed in snapdragon 675 to 2.0 GHz. Qualcomm Snapdragon 675 and Snapdragon 712 both comes with the Company’s own branded AI dubbed as Qualcomm Hexagon 685 DSP. Ut gas a third generation vector extension and All wave Sensor Hub. It has Qualcomm Neural Processing SDKalong wiuth the many popular frameworks suport like Caffe, Caffe2, Tensor flow, Tensorflow Lite etc. making the processor universally acceptable for the smartphone manufacturers to train the processor for various AI tasks. The Qualcomm Snapdragon 712 has qualcomm spectra 250 images signal processor that has support for a 32 MP Single Camera Sensor & upto 20 MP Dual Camera. It was launched with suport for 48 MP single sensor then more and more manufactures will have used it. The Qualcomm Snapdragon 675 has the well-known 48-megapixel single camera sensor support along with the support for the dual 16+16-megapixel telephoto arrangement. The processor comes with the company’s own Image Signal Process called Qualcomm Spectra 250L ISP. This makes the processor process the clicked images in a better way. With this processor, you can capture videos in up to 4k resolution at 30fps. Qualcomm Snapdragon 712 has X15 LTE modem that can support LTE Cat 15 to give a peak Download Speed up to 800 Mbps. It uses Cat 13 with a peal speed up to 150 Mbps for uploading. It also Support for other options like Dual 4G Volte, Dual Band Wifi, Blue Tooth 5.0, USB 3.1, Type-C, NFC, GPS . It has support for Qulacomm Quick charge 4+ which can charge smartphones 50 % in jus 15 mins. Qualcomm Snapdragon 675 has X12 modem that can support Cat 15 based 600 MbpsDownlod spedd . It uses 15. Mbps upload speed. It also support for other options like DualG VolTE, Tribrand Wifi, Bluetooth 5.0, GPS, FM Radio. It has also support of Qualcomm Quick Charge 4+ which can charge Smartphone’s 50% in just 15 mins. The conclusion of Qualcomm Snapdragon 712 vs Snapdragon 675 comaprision is a very tricky. first of all talking about CPU Perforamcne, Snapdragon 675 CPU performance is much better than Snapdragon 712. Then in terms of GPU Snapdragon 712 has Adreno 616 whereas Snapdragon 675 has Adreno 612. So the GPU of Snapdragon 712 is the best. The Snapdragon 675 is based on the 11 NM process where as Snapdragon 712 porcess based chipset. The narrrow FinFet proces means more power efficiency so Snapdragon 712 will be slight edge in this round. Lastly talking about camera support, the Snapdragon 675 has support for 48 MP native camera sensors where as Snapdragon 712 has support for 32 MP single camera sensor. So the Snapdragon 675 is good for camera support. That’s overall comparision between Qualcomm Snapdragon 675 vs Snapdragon 712. Which is better for you please share your thought in the comment box.